The Surveyor General of India, Dehradun. SUB: MISUSE OF POWERS & POSITION AND ALSO MAKING UNNECESSARY HARASSMENT TO THE EMPLOYEES BY Dr. M. STALIN DIRECTOR BIHAR GDC. SURVEY OF INDIA, PATNA — YOUR INTERVENTION REGARDING. New Delhi: Central government employees are in for a disappointment as the Centre is at present not considering any move to raise the retirement age to 62 years. "There is no proposal to increase the retirement age to 62 from 60 years. The Ministry is not working on any such proposal," the official said. Recent media reports claimed that the Ministry has written to Prime Minister's Office for raising the retirement age and sought the Union Cabinet's nod for the purpose. Reference is invited to Pension Fund Regulatory and Development Authority Circulars issued under Letter Nos. PFRDA/2013/10/CRTB /1 dt. 30.04.2013 86 31.05.2013 (copies enclosed) regarding appointment of Axis Bank as a new Trustee Bank in place of Bank of India (the current Trustee Bank) for National Pension System (NPS) with effect from 1st July 2013. Minutes of the meeting held on 28.5.2013 with the representatives of Staff Side, National Council (JCM) on pensionary matters. F.No.12/5/2013-JCA-2 Government of India Ministry of Personnel, Public Grievances and Pensions (Department of Personnel and Training) North Block, New Delhi Dated the 11th June, 2013 Subject: Holidays to be observed in Central Government Offices during the year 2014. 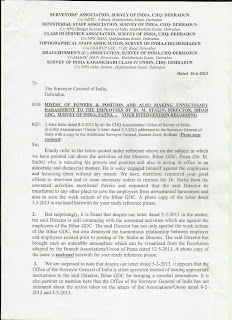 03.06.2013 Office Memorandum Sub: - Software (e-PPO utility) for processing pension cases. 1.Optimum utilization of manpower with speed and accuracy has been a thrust from the time immemorial. The revolution in Information Technology has made it possible to overcome it to a greater extent. So far, in Central Pension Accounting Office Special Seal Authorities authorizing the banks for making payments of pensions have been generated after feeding the relevant data manually based on special seal authorities received from different Pay & Accounts Officers. On the basis of this feeding data-base of pensioners is updated in Central Pension Accounting Office. No.26/5/2013-PPD Government of India Ministry of Finance Department of Expenditure (Procurement Policy Division) North Block, New Delhi Dated 25th April, 2013 Office Memorandum Subject:- Implementation of Court Order dated 13.4.12, passed by the Hon'ble Delhi High Court in WP(C) No. 2092/2012.It has been observed that there are many instances of a tender being rejected or tender documents not being issued and when the party enquires reasons, the same are not- communicated, leading to unnecessary litigation. In such cases the first round of litigation is to find out the reasons and the second round is to challenge the reasons. 2.In this context, the Hon'ble Delhi High Court, in its Final Order in WP(C) No. 2092/2012, has directed that a communication be circulated to all Government Departments to disclose reasons in such cases where enquiries are made by a contracting party, so as to avoid unnecessary litigation. Revision of rates of damages for unauthorised occupation of General Pool Residential Accommodation in metropolitan cities of India. Change in the rates of subscription: Army Group Insurance Fund (AGIF). Date: 04.06.2013 Sub: Change in the rates of subscription: Army Group Insurance Fund (AGIF). necessary action. The enhanced rate of monthly subscription is to be recovered commencing from pay for Aug 2013 payable on 31.08.2013. S.No.QuestionAnswerIntroduction and Objective 1. Under what provisions of Government, appointments on compassionate grounds are regulated? The appointments on compassionate grounds against a post in Central Government are regulated in terms of the provisions of "Scheme for Compassionate Appointment under Central Government" issued under Department of Personnel & Training O.M. No. 14014/6/1994- Estt(D) dated 09.10.1998, as amended from time to time. All the instructions on compassionate appointments have been consolidated vide O.M. 14014/02/2012-Estt(D) dated 16.01.2013 and are available on the Department's website www.persmin.nic.in(OMs & Orders> Establishment>(A) Administration (Ill) Concessions in Appointments (a) Compassionate Appointments). Central govt employees’ retirement age to be extended by 2 years to 62: Financial ExpressThe government is planning to extend the retirement age of all central government employees by two years — from the current 60 to 62 years. Sources said that an in-principle decision has been taken in this regard and the department of personnel and training (DoPT) has begun the work to implement the same. A formal announcement to this effect is expected this year itself.